So for Christmas Day I needed the perfect desert. I wracked my brain for all my favorite treats, should I make cheesecake, pie, cobbler, or brownies? Then it dawned on me, and I heard the Nutella angels sing. I had gotten a couple jars of Nutella as gifts and so I knew that was a sign. I looked online for the perfect recipe -perfect being one that I had all the ingredients for, since it was Christmas Day and I did not want to go out. I settled upon this Nutella cake recipe made by two hot twin Italian chefs, you can’t go wrong with that. Plus this recipe had cream cheese/Nutella frosting which meant it would make Campy happy as well as he loves cream cheese frosting. This cake came out amazing. It was very fudgy and rich but it only used 1/3 cup of flour so it didn’t seem so heavy. 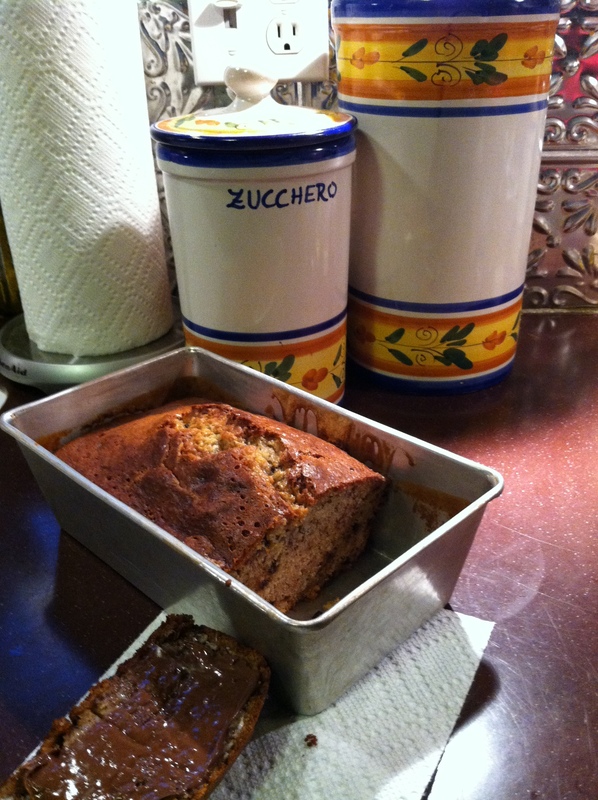 Also it had a ground up hazelnuts in the cake so that kind of gave it a nice texture. The cream cheese frosting mixed with Nutella had a little bit of tartness which I really liked. It was such a big hit I even had a slice today for breakfast with my coffee! Everyone who knows me, knows my love of Nutella Brownies. I have posted recipes before but I was not 100% satisfied with the results. The last one I posted had too much sugar and too much cocoa as well as chocolate chips – which were unnecessary. First of all, Nutella contains sugar and cocoa, so I wanted that to be the ingredient that provided those. Don’t get me wrong, I don’t discriminate when it comes to brownies and I happily eat any result, but the last batch was too rich for me. So I tried another recipe on my quest. I think this is a valiant and noble quest for a woman of my generation. On my journey I looked for a recipe with less sugar, less or no cocoa, and mainly Nutella to satisfy the chocolate/sugar ingredient. I am thinking maybe in the future I will just experiment and make up my own. But for now, I made the following recipe for a pizza night for friends about a month ago. I was very pleased with the results, the brownies were moist and Nutella-rific, not too much sugar or chocolate tasting and the salt was an extra treat. I think that having less flour made them like a rich piece of fudge. I also liked the salt, as I did in my chocolate chip blondie recipe, it adds a nice mix f sweet and salty. So if you are a Nutella junky like me, check out this recipe for a special treat! Preheat oven to 350°F. Line the bottom and sides of an 8-inch or 9-inch square baking pan with aluminum foil or parchment, leaving an overhang on all sides to easily lift the brownies out of the pan when cool. (If using a 9-inch pan, the bake time will be a few minutes less.) Set aside. With a handheld or stand mixer fitted with a paddle attachment, beat the butter on high speed in a large bowl until smooth and creamy, about 1 minute. Add the brown sugar and beat on high speed for 1-2 minutes until creamed. Scrape down the sides and up the bottom of the bowl as needed. With the mixer running on low speed, add the eggs and vanilla extract. Beat on medium-high speed until combined, then beat in 1 cup Nutella and salt. Mix until smooth and fluffy. Scrape down the sides and up the bottom of the bowl as needed. With the mixer running on low speed, add the flour, mixing just until combined. Do not over mix. Pour the batter into prepared baking pan. Drop teaspoonfuls of the remaining 1/4 cup Nutella on top. Using a knife, swirl the Nutella into the batter. Top with a sprinkle of sea salt. Bake the brownies for 30-36 minutes. Keep your eye on them and test with a toothpick to determine doneness. If the toothpick comes out with only a couple moist crumbs, the brownies are done. The brownies may take a few minutes longer; all ovens vary. Mine took 28-30 minutes, I always cook brownies less because I like them a bit less done, plus I used a 9-inch pan. Allow the brownies to cool completely in the pan set on a wire rack. Once cool, lift the foil out of the pan using the overhang on the sides and cut into squares. I have had this blog for a while so I should comb back through my posts to see if this title is worthy. But I really don’t think I need to, as I think it was the best dessert I have ever made. It was simple to make and it combined my two favorite things, chocolate and marshmallows. My mom and I try to make each other amazing desserts on our birthdays. So yesterday I made her this wonderful treat in honor of her birthday. I started off with one word in mind – chocolate, as this is my mom’s favorite type of treat. I looked for decadent chocolate desserts, but did not come up with anything that seemed just right. So I went to my favorite website for desserts – King Arthur Flour, and I hit a home run when I typed in “chocolate desserts” and found triple treat hot chocolate cake. I know my mom likes chocolate and marshmallow just as much as me, so I knew this would hit the spot. Triple treat hot chocolate cake was incredibly easy to make, which is rare for a decadent chocolate dessert, and it had ingredients I had in my kitchen. The bottom layer is a melted chocolate sauce – I used 60% cacao Ghirardelli chocolate chips (the only ones I like to buy), which you melt in the microwave with half and half. The middle layer seems to be a very liquid cake batter, but trust me it sets and makes the perfect fluffy cake. The top is made of big marshmallows you add on for the last few minutes, just to soften, and it is the perfect topping. If you like hot chocolate with marshmallows, this dessert embodies that in a bowl. The rich chocolate sauce, moist cake and melted marshmallows sang a happy song in my mouth and my belly. My daughter and husband said it was too rich but for me it had all the elements of a perfect dessert. I think my mom was pretty pleased too as I saw her sneak a few more spoonfuls when she went back through the kitchen. Please excuse the messy picture but I didn’t snap one before we all dug in. It says with the leftovers to nuke them a bit before enjoying, to warm up all the melty layers. So if you have liked the sweat treats I have posted before you have to try this! Preheat the oven to 350°F. Lightly grease a 9″ round or 8″ square pan (I used a 9.5 inch pie dish). Make sure whichever you use is full-sized — at least 2″ deep. To make the bottom: Combine the chocolate chips and half & half or cream in a microwave-safe bowl, and heat until the chips are soft and the cream is very hot. Remove from the microwave, and stir until you’ve made a smooth, dark sauce; just keep stirring, you’ll get there. If any unmelted chips remain, reheat briefly. Spread the sauce in the bottom of the prepared pan. To make the middle: In a medium-sized mixing bowl, whisk together the flour, baking powder, salt, cocoa, sugar, and espresso powder. If the mixture is lumpy, sift it. Stir in the water, vanilla, and melted butter. Gently stir until everything is just combined. Pour the batter over the sauce in the pan. Bake the cake for 40 minutes, until the top appears set and the bottom is bubbling (and making the top jiggle). Remove the cake from the oven, arrange the marshmallows evenly over the surface, and return to the oven for 3 minutes, just to soften the marshmallows. Remove from the oven, wait 2 minutes, and serve immediately. This cake is best enjoyed within 30 minutes of baking. For any leftovers, reheat briefly in the microwave. Anyone who knows me, knows how much I love brownies. If I go to a frozen yogurt sundae bar, a brownie is my first choice in my cup. I have written before about how much I love boxed brownies. For someone who bakes most things from scratch that may be odd. But I grew up on brownies from scratch so a box mix at a party was my favorite treat. Though I do love my mom’s brownies, the texture and stickiness of box brownies is my favorite. I have an awesome college friend who shares my love of brownies, my brownie husband recipe is one of her favorites. I googled homemade brownies that taste like a box mix and found an amazing recipe. I would say I have made it a dozen times since I found it last year. It is perfect for any occasion and people can’t believe they are from scratch. I recently made them and used the Hershey’s Special Dark cocoa instead of regular cocoa and it made them even more decadent. So if you are a closet Betty Crocker box brownie junkie like me, you need to try these! They are super easy and only have a few ingredients instead of ones you can’t pronounce, which is something I always look for when recreating stuff at home. 1. Preheat oven to 350 degrees. Grease a 9×9 square baking pan, or line it with parchment paper. Mix together dry ingredients, add wet ones and mix till no lumps. Nuke for 70-80 seconds depending on microwave watts. I used a small mixing bowl that is microwave safe because you would need a super large mug to make it. So I guess that makes it a bowl cake, lol. The recipe also said you can insert a spoon of Nutella in the middle and swirl it in upon serving but it did not need that. That would have made it too sweet. 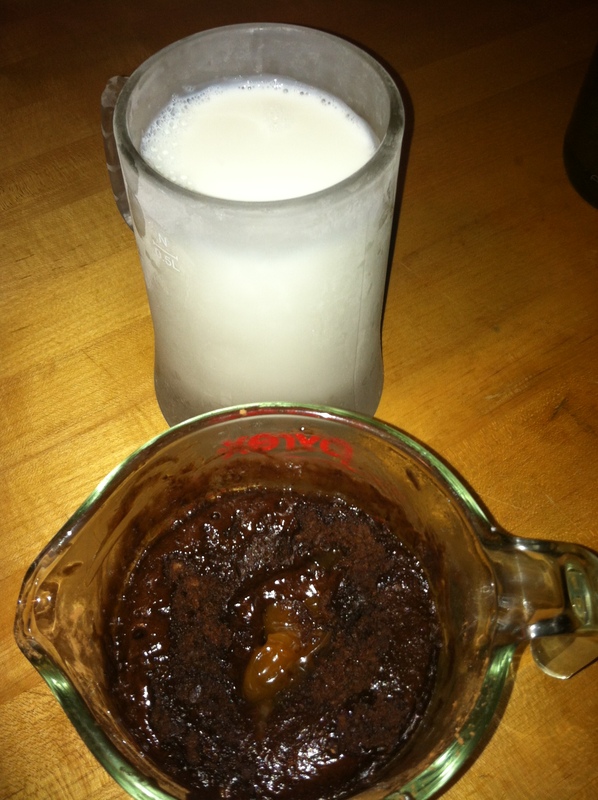 It was a bit gooey in center but that made it sort of like a molten lava cake, so I did not cook it any longer. You will not believe how moist and delicious this cake is in mere seconds in your microwave. It hit the spot! I think you could bake anything sweet into a cheesecake and it would be delicious. Chocolate caramel candies are my favorite sweet treat and they would also be a delicious addition to any recipe. So when my hubby asked (* insert subliminally persuaded) me to make Rolo Cheesecake Bars for him by casually posing a pic on my Facebook wall, how could I resist? We decided to make them for a family get together that way we would not eat the whole 9×13 dish ourselves. Needless to say they were AMAZING. Think chocolate and caramel combined with creamy cheesecake and golden graham cracker crust – how can that be bad? 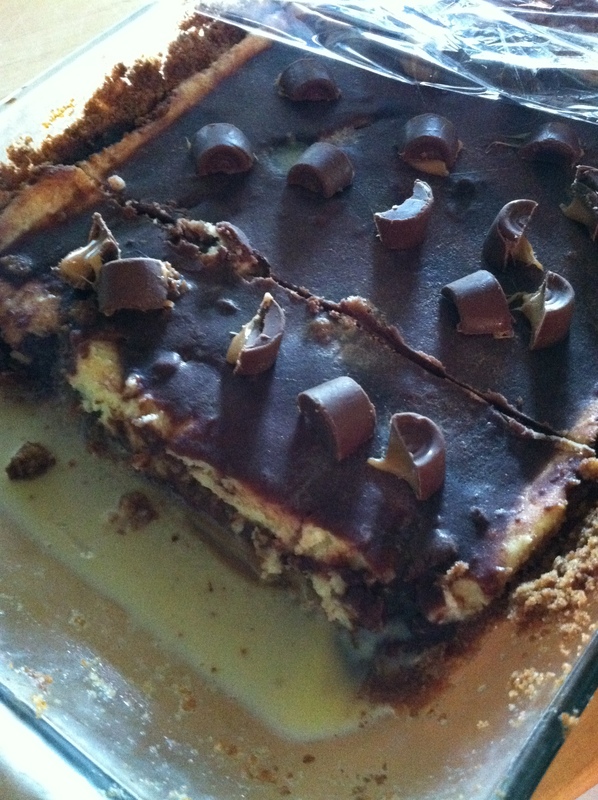 The rolos melted into the cheesecake batter in the oven and the chocolate glaze was an additional treat. Top it with rolos for decoration and you have the best tasting cheesecake bar you have ever tasted! Stir all together and press into a 9×13 pan lined with nonstick foil. Bake crust at 350 degrees for 7-10 minutes and cool. Beat until smooth, then add one package of mini rolos – the kind in the zip pack that are unwrapped. Pour onto the cool crust and bake cheesecake for 30-35 minutes at 350 degrees. Let cool and add glaze. Melt in microwave. Stir until smooth and add 4 teaspoons of light corn syrup. Pour smoothly on cheesecake bars and chill overnight. Cut with big knife. Garnish with half a rolo and/or chocolate drizzle. I got home from work today and decided I was in the mood, to bake that is. Sometimes I think that might be even more exciting to my husband, as he loves my baking, haha! I didn’t try out anything new, just stuck to some trusty go to recipes I love to make. I love making my homemade easy pizza dough and so does the family. Best part was I had leftover of my mom’s famous roasted sausage, peppers and onions, so I had a great topping to add. The Bunny made me do it! Today the girls have me making this Easter Bunny cake we saw on food network. I decided to make my bunny chocolate so I had to find the perfect chocolate cake recipe (posted below). I have caught a few episodes of the Pioneer Woman and I thought I’d give her cake a go since her recipes look simple and delicious. I will post a pic of the bunny later, but for now, here is the chocolate cake. I halved the recipe since I only need 2 round cakes and it came out perfect! 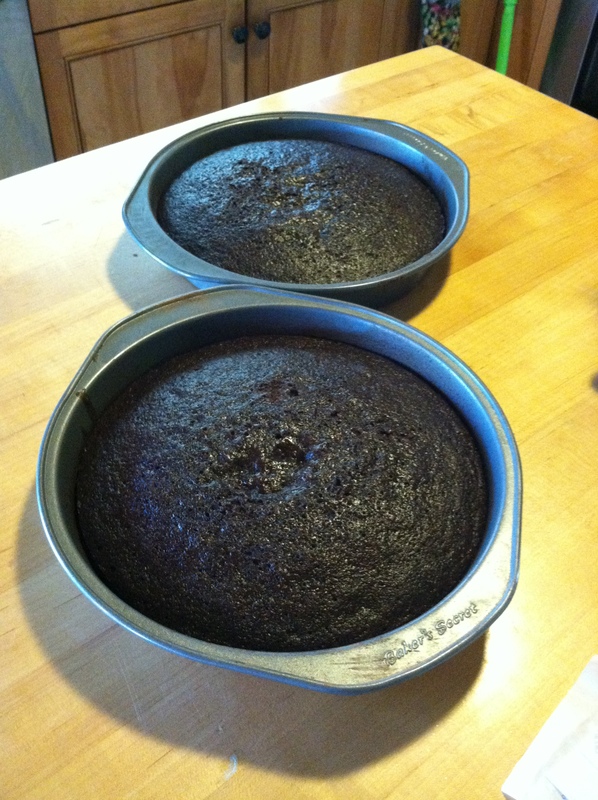 For the cake: Preheat the oven to 350 degrees F. Heavily grease and dust with cocoa four 9-inch round cake pans. In a saucepan, melt the butter. Add the cocoa. Stir together. Add the boiling water, allow the mixture to boil for 30 seconds and then turn off the heat. Pour over the flour mixture and stir lightly to cool. Combine the buttermilk, baking soda, vanilla and beaten eggs. Stir the buttermilk mixture into the butter/chocolate mixture. Cool completely before icing. Refrigerate the layers after cooling for best results. Two different friends sent me the recipe for today’s inspiration, a Nutella mug cake. I had wanted to try it for so long. In case you have not heard of a mug cake, it is a mini version of a sheet cake that you microwave in a coffee mug to have a single serving of joy, rather than a whole big cake you finish with a Lifetime movie. This cake was super easy to make and it tasted amazing! I don’t know that I could taste the Nutella so much, but it was chocolately and rich. I read the reviews posted online, which can often be a helpful tip when trying a new recipe, and people said how it was enourmous and it ran over in their largest coffee mugs. I also read that it was approx 1,100 calories (yes you read that right, for one mug?? WTH!) s0 I HALVED the recipe to not gorge too much. I also made my cake in a microwave safe pyrex glass measuring 2 cup, rather than a mug, to have plenty of room for the cake to expand, I highly recommend this. 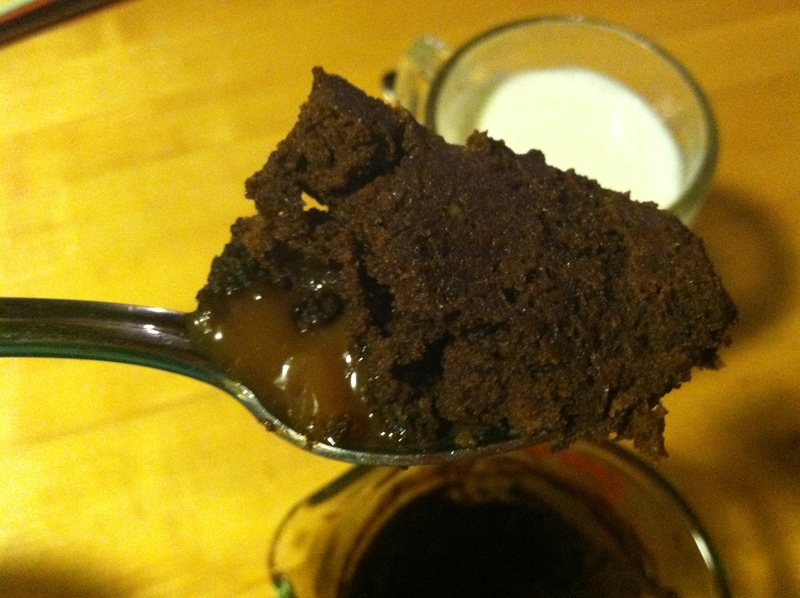 The result was a moist decadent treat that was like having a warm slice of chocolate cake straight out of the oven and it was the perfect portion to fill my craving.Who would have known you could bake a cake in the microwave and it would come out so good, how cool! 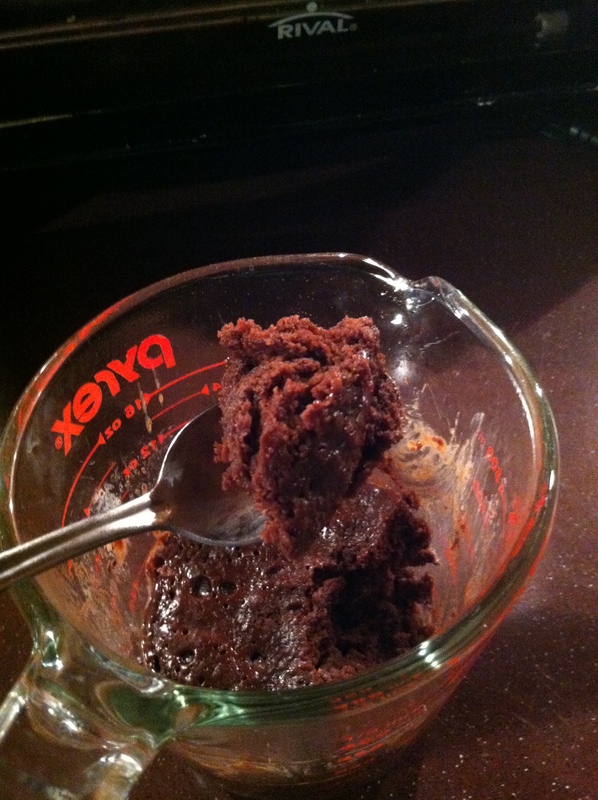 I highly recommend checking this recipe out if you have never tried a mug cake! 1. Combine all ingredients in a microwave safe large coffee mug or pyrex 2 cup glass measuring cup. Whisk well with a fork until smooth. Microwave on high for 1 1/2 – 3 minutes. (Time depends on microwave wattage. Mine took 1 and 1 /2 minutes.) Top with whipped cream, ice cream or a little chocolate sauce if desired.